On Wednesday 14 June 2017, independent retailers gave away more than 10,000 organic mini breakfasts in the UK and Ireland as part of this year’s Wake Up To Organic event. Our national campaign tripled in size from 2016, with more than 250 retailers and cafés taking part and many reporting increased footfall as a result. 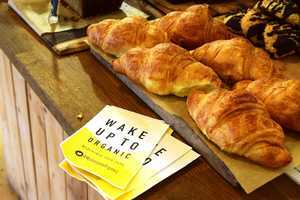 The campaign was also supported by top chefs including Tom Hunt, Olia Hercules and Jordan Bourke and several leading organic brands hosted their own Wake Up To Organic events, including Yeo Valley and Riverford. Breakfast goods were donated by event sponsors: Alara Cereals, OTE Superfoods, BonPom, Clearspring, Helen Browning’s, iRaw Healthy Habits, James White Drinks, Pukka Tea, Plenish, Meridian, Organico, Flahavan’s, So Free Chocolate, Mr Organic, Greenscents, Rebel Kitchen, Community Foods and Herbfarmacy. While Infinity Foods sponsored the production and distribution of resources to every store taking part. Favourite recipes, breakfast competitions and photography were shared on social media on the day, resulting in Wake Up To Organic trending on Twitter from 8am until lunchtime. We're delighted that on Twitter over 2,000 people used the hashtag, reaching over 2.7 million people online. While, the PR campaign secured over 130 pieces of coverage across consumer, trade and regional titles reaching over 4.2 million people. Catherine Fookes, Campaign Director, said: “The UK and Ireland really embraced Wake Up To Organic this year, with producers, chefs, retailers and bloggers all coming together to help raise awareness of the benefits of organic. The date for this year's event is Wednesday 13 June 2018.